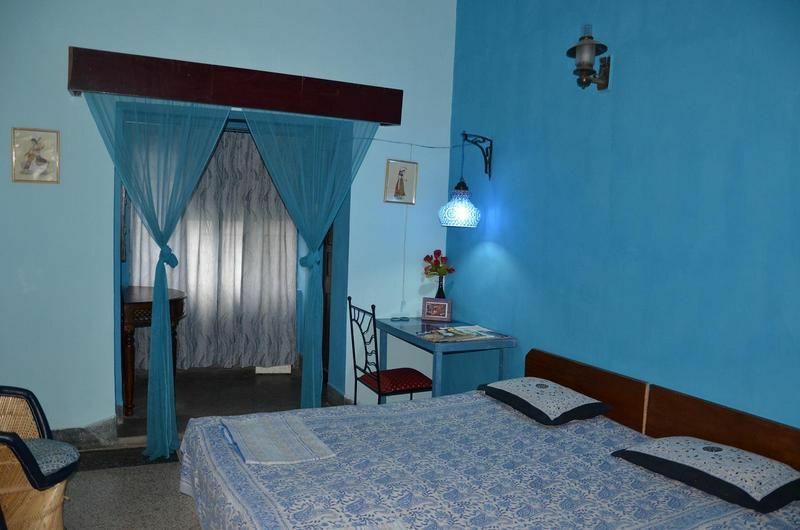 Ours is a small Bed and Breakfast Hostel for tourists visiting Jaipur. 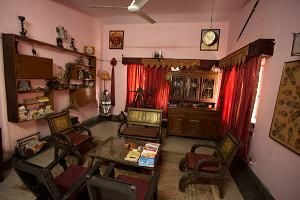 The Hostel is of 4 rooms, recognised by the Tourism department , Government of India under their Bed and Breakfast scheme.Our Aim is to provide personalized and Homely feel to your stay with us in our city, Jaipur.It is a bed and breakfast set up with the comforts and warmth of a family home, where we sit together and eat, drink and share our travel experiences, discuss the next days program and places to see, laugh and sing and create our bonds for life.Our facilities include: AC and Non AC Rooms with clean and hygienic attached baths. 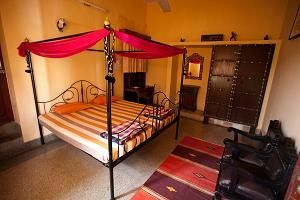 Each room has a special touch to it with ethnic and traditional decor. We also have a library and a gym in the premises. Wi Fi Internet. Home made Dinner on demand. Guest Kitchen on payment. Rooftop. Cycles and Motorcycles can be arranged on rent. Car rentals and tours help is provided. Bus/Train/Air Ticketing provided.Yoga Guidance provided at very nominal fees ,Paid yoga classes also arranged.Check In/Out time: 12 Noon/11AMArrivals accepted: between 8AM to 11 PM onlyWe will wait till 2 hrs beyond the arrival time mentioned in the booking, thereafter the booking will be cancelled and room released to other guests. WE ARRANGE FREE PICKUP(between 7AM and 11PM) FROM BUS STAND AND RAILWAY STATION(subject to availabilty). CHARGED PICK UP FROM AIRPORT CAN BE ARRANGED.From the Air Port: the hostel is 12 kms. You catch a cab, come to Paanch Batti on MI Road, ask for State Bank of Bikaner and Jaipur on Gopinath Marg.. Take the lane opposite to the bank and enter the Purohit Ji Ka Bagh residential Area. At the end of the lane turn left. The last corner house is the Explorer's Nest.From the Railway station: the hostel is 2 kms. You catch a auto rickshaw, come to Jalupura Crossing on Gopinath Marg, ask for State Bank of Bikaner and Jaipur. Take the lane opposite to the bank and enter the Purohit Ji Ka Bagh residential Area.End of the lane turn left , the last corner house is your Explorer's Nest.From the Bus stand: the hostel is 1 km. You catch a cycle rickshaw, come to Jalupura crossing, Gopinath Marg . Take the lane opposite State Bank of Bikaner and Jaipur to enter the Purohit Ji ka Bagh residential Area. Take the left turn where this lane ends, the corner house is your Explorer's Nest.Another way is : come to PAANCH BATTI on M I Road Come to DARBAR SCHOOL GATE . The residential colony opposite Darbar School Gate is the Purohit JI Ka BaghLand Marks: Venus Bakery, Darbar School Gate, Tanishque/ Lewis Showroom, Paanch Batti, Jalupura crossing.